In early March 2019 a two-day seminar will be held in the Royal Irish Academy library to explore the contexts and contents of an important sixteenth-century Connacht manuscript miscellany. When the Academy purchased this Irish manuscript in 1851, as part of the collection assembled by Sir William Betham (1779–1853), it was known as ‘Betham 145’. Nowadays it is known simply by its Academy shelf-mark, 23 N 10, or else as the ‘Book of Ballycummin’ based on its presumed place of origin. Among those who spent time in Seán Ó Maoil Chonaire’s school at Ballycummin on the banks of the Shannon in north Roscommon in 1575, the manuscript would have been known as Aodh’s book, since Aodh was the principal scribe who worked on it. We don’t know his surname. When a fellow scribe, Dubhthach, copied a text on the Triads of Ireland into the manuscript in late June 1575 he added a note (p. 101) addressed to Aodh. Dubhthach’s note addressed to his fellow scribe is interesting also because it reveals that the scribes were consciously selecting texts for inclusion according to their perceived reference value. RIA, MS 23 N 10, page 101. The first half of the page is the work of Dubhthach, ending with a 4-line note to his fellow student, Aodh, for whom the book was being made in 1575. The main scribe, Aodh, adds ‘Go roibh maith agat’ and then resumes his work on the second half of the page. During most of the spring and summer of 1575, work on this new manuscript miscellany was done at the house of Seán Ó Maoil Chonaire at Ballycummin, in the parish of Kilmore, in north Roscommon, though some sections were written at a slightly different location, at Ballyhubert (Baile Hoibeard) in the nearby parish of Lissonuffy. It’s interesting that they were still in the company of Seán Ó Maoil Chonaire at the new venue. The precise exemplars used by the scribes of 23 N 10 are unknown, but the manuscript they made is particularly valuable because it appears to draw on a tradition of Connacht manuscript-making that can be traced back to the lost Cín Dromma Snechta, which may have dated from the early eighth century. The Ballycummin manuscript shares this characteristic with some other sixteenth-century manuscripts including British Library MS Harleian 5280, written by Gilla Riabach Ó Cléirigh at Corrlios Conaill in the parish of Kilmore, Co. Roscommon, and British Library Egerton 88, written 1564–70, as well as Bodleian MS Rawlinson B 512, a miscellany that was partly the work of Uí Mhaoil Chonaire scribes. It seems that the north Roscommon home of Seán Ó Maoil Chonaire contained some very important manuscript exemplars, and that Seán himself was an active tutor of younger scholars. His was a particularly accessible school, on the banks of the Shannon at Lough Boderg, the river being the highway through which scholars and their manuscripts travelled and maintained contact with other like-minded people throughout the Shannon region. The scribes of RIA MS 23 N 10 do not tell us much about the head of their school. Seán Ó Maoil Chonaire is not an uncommon name, but it is just possible that he was the same Seán Ó Maoil Chonaire whose influence was acknowledged by other scholars more than fifty years later. In 1643, Mícheál Ó Cléirigh’s small Irish dictionary, Focalóir no sanasan nua, was printed at Louvain. Published at the very end of Ó Cléirigh’s life, this Irish dictionary contained an address to the reader in which Ó Cléirigh acknowledged the influence of Séan Ó Maoil Chonaire, ‘chief historian … of the men of Ireland’. Ó Cléirigh was particularly interested in obscure and obsolete Irish words, and mentioned Seán Ó Maoil Chonaire as one who had been able to interpret the relevant older manuscripts. One of the many questions prompted by our important ‘little remnant of the work of the ancients’ is whether or not this renowned historian and keeper of manuscripts who was still remembered in the 1630s and 1640s though no longer alive, was the same teacher whose school at Ballycummin had provided the exemplars for the manuscript now usually referred to as RIA MS 23 N 10. Or was there a Thomond connection? Listen back to the conference which took place 7 – 8 March 2019 and join in the exploration of Ireland’s medieval literary heritage through the lens of one particularly fascinating manuscript, RIA MS 23 N 10. Richard I. Best (1954), Facsimiles in collotype of Irish manuscripts, VI: MS 23 N 10 (formerly Betham 145) in the library of the Royal Irish Academy (Dublin: Irish Manuscripts Commission). Fergus Kelly (ed.) (1976), Audacht Morainn (Dublin: Dublin Institute for Advanced Studies). Kuno Meyer (ed.) (1906), The Triads of Ireland (Todd Lecture Series, 13) (Dublin: Hodges Figgis). Arthur K.W. Miller (ed. & transl.) (1880–1), ‘O’Clery’s Irish glossary’, Revue Celtique, 4, pp 349–428; 5, pp 1–69. Kathleen Mulchrone (1937), Catalogue of Irish manuscripts in the Royal Irish Academy, fasc. 22, cat. no. 967 (Dublin: Royal Irish Academy), pp 2769–80. Kevin Murray (2018), ‘The late medieval Irish-language manuscript tradition in North Roscommon: the case of Royal Irish Academy MS 23 N 10’, in R. Farrell, K. O’Conor and M. Potter (eds), Roscommon: history and society (Dublin: Geography Publications), pp 191–209. Tomás Ó Concheanainn (1988), ‘A Connacht medieval literary heritage: texts derived from Cín Dromma Snechtai through Leabhar na hUidhre’, Cambridge Medieval Celtic Studies, 16, 1–40. Tomás Ó Concheanainn (1990), ‘The textual tradition of Compert Con Culainn’, Celtica, 21, 441–55. Brian Ó Dálaigh (2008-9), ‘The Uí Mhaoilchonaire of Thomond’, Studia Hibernica, 35, 45–68. John O’Donovan (ed.) (1851), Annals of the kingdom of Ireland by the Four Masters (7 vols, Dublin). Nollaig Ó Muraíle (2004), ‘Athchuairt ar lámhscríbhinní Chonnacht’, in Ruairí Ó hUiginn (ed. ), Oidhreacht na lámhscríbhinní (Léachtaí Cholm Cille, 34) (Maynooth: An Sagart), 28–104. Pádraig Ó Riain, et al. (2005), Historical dictionary of Gaelic placenames: Foclóir stairiúil áitainmneacha na Gaeilge. Fascicle 2 (names in B–), (London: Irish Texts Society). Translated in Murray (2018), p.196. Ó Riain, et al. (2005), ii, p. 31. Translated in Miller, (1880), iv, p. 354. Cited and translated in O’Donovan (1851), I, p. lxviii, giving Trinity College, Dublin copy of the Annals of the Four Masters as his source. 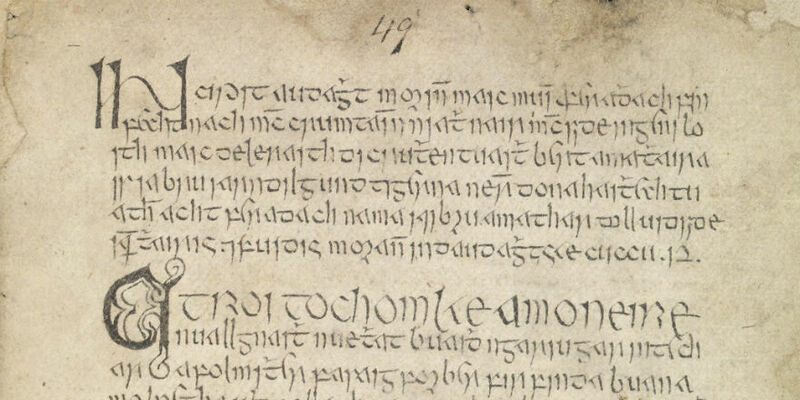 Main image: RIA, MS 23 N 10, detail from page 49, beginning of ‘Audacht Morainn’ (‘The testament of Morann’), a literary text containing advice for a king. This source for the history of kingship in early Ireland preserves a valuable example of Old Irish from circa AD 700.